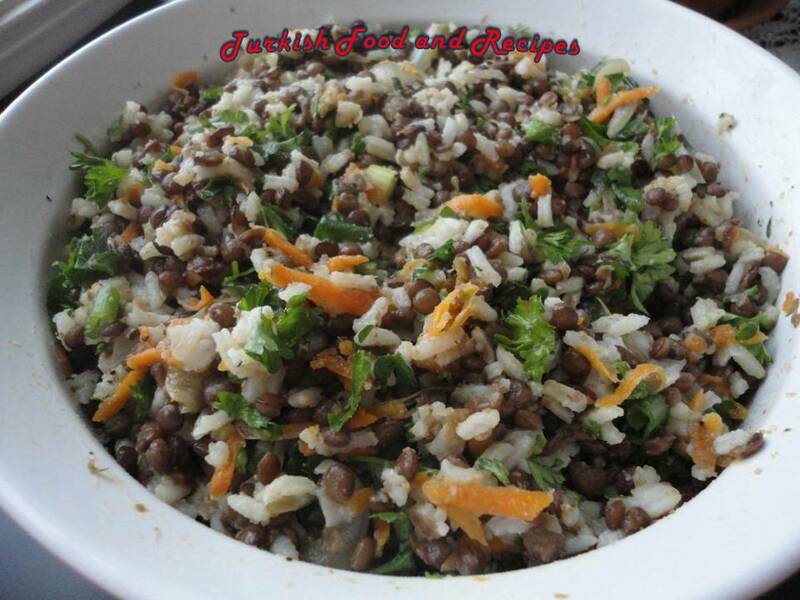 Cook rice and green lentils separately and let them cool. Meanwhile, take olive oil in a skillet and sauté onions for about 5 minutes over medium heat. Stir in grated carrots and sauté for additional 6-8 minutes. Let cool for a while. Finally, combine sautéed onions and carrots with cooked green lentils and rice. Add all of the remaining ingredients and mix them all. Pirinc ve yesil mercimegi ayri ayri pisirin ve sogumaya birakin. Bu sirada, zeytinyagini bir tavaya alin ve soganlari sote edin. Yaklasik 5 dakika sonra, rendelenmis havuclari ilave edin. Orta ateste 6-8 dakika kadar soteleyin. Sogumaya birakin. Son olarak sotelediginiz sogan ve havucu, pismis pirinc ve yesil mercimegi genis bir kaba alin. Uzerine geri kalan butun malzemeleri de ilave ettikten sonra, hepsini guzelce harmanlayin. Very satisfying> I have to look through your recipes...loking to do a Turkish post.